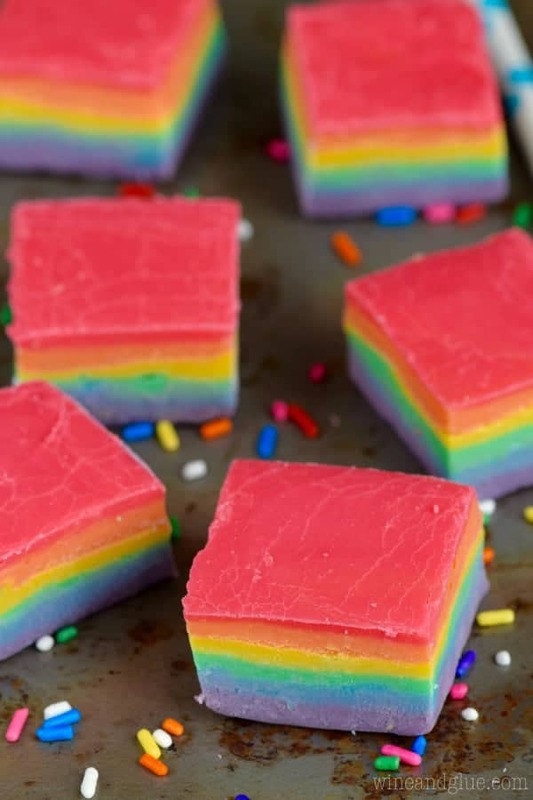 This Rainbow Fudge is super easy but will wow everyone! So easy the kids can do it! All of last week Nathan was gone on a work trip. And when I’m the only grown up in the house I have the tendency to . . . . lose it. So one day I saw that our front door was unlocked. In a matter of seconds I convinced myself that I had left the door unlocked for the last week and a half and obviously someone had come into the house, knowing the door was unlocked, and was just in the basement laying in wait for me. I had this thought approximately one minute before I was headed to bed. The next morning I got up really really early to work out. I’m running on the treadmill . . . . in the basement . . . where I’m convinced that the culprit is just waiting for the right minute to kill me. Suddenly I see something out of the corner of my eye. I keep telling myself that it’s just the light reflecting off my wedding ring. I keep seeing it, and keep seeing it, when I look over. It’s a spider that has dropped down from the ceiling and is now dangling inches from my ear. I momentarily forget I’m running on a moving treadmill, jump to slap it between my two hands, land back down on the treadmill, and nearly trip and kill myself. You guys. I’m so happy Nathan’s home. Okay, this fudge isn’t scary at all. 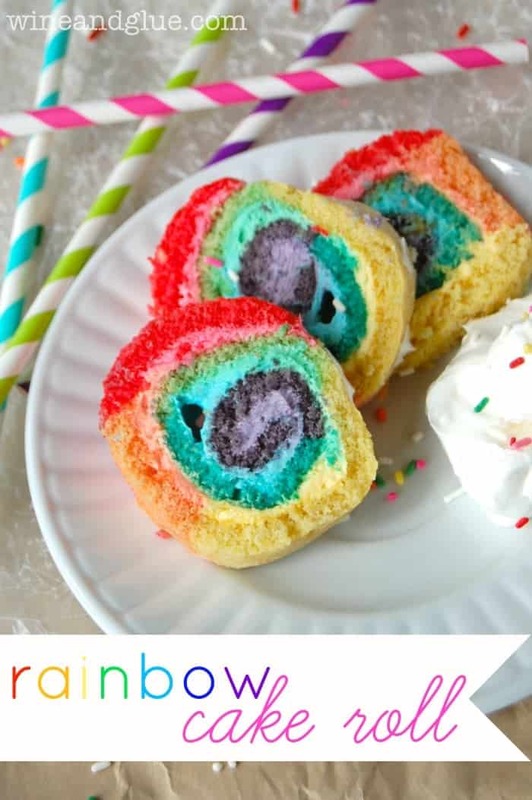 Not even to make. It’s SUPER EASY! It’s based on the idea that you can mix together three cups of chocolate chips and a 14 ounce can of sweetened condensed milk, and you can make fudge! So I broke it down into sixths. 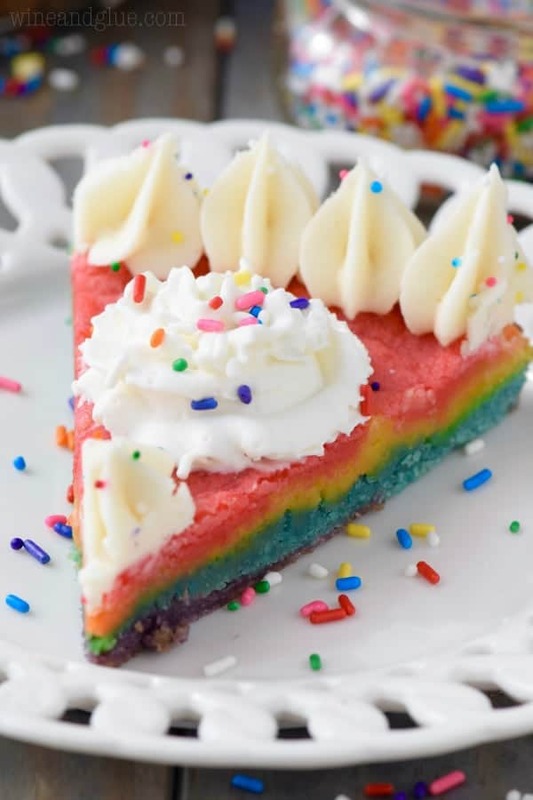 That amounted to a half cup of white chocolate chips and 3 TBSPs plus 1 tsp of sweetened condensed milk for each color. Each color took about 8 drops of color, with the exception of red. That took 16 drops. Obviously for purple you need 4 drops of red and 4 drops of blue. And for orange you need 4 drops of red and 4 drops of yellow. You make one layer at a time, and you might want to space them out a little and not make them back to back as I did. I made them in my microwave, and by the end, it was over heating a little. You add it one layer at a time and once it’s dry you just pop it out, cut it, and look at your beautiful creation. Line an 8 by 8 inch glass baking dish with aluminum foil. In a small bowl combine 1/2 cup white chocolate chips and 3 TBSPs plus 1 tsp sweetened condensed milk. Microwave for 30 seconds and stir until smooth. Stir in 4 drops of red food coloring and 4 drops of blue food coloring to make your purple layer. 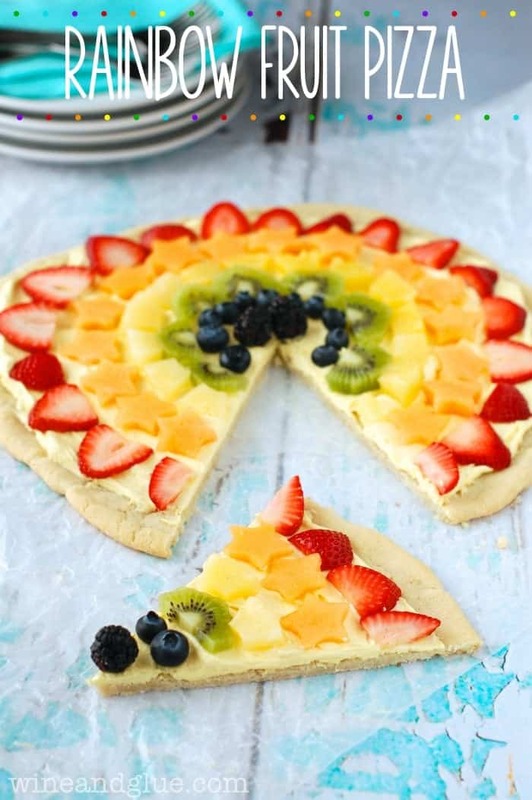 Spread it as evenly as possible. Set the fudge in the refrigerator to cool while working on the next layer. Once the fudge has completely cooled, remove it from the pan, peeling off the aluminum foil. Cut the fudge into squares and store outside of the refrigerator for up to two weeks in an airtight container. I used to be so scared when Mel was gone, then we got the dog. The dog who was afraid of the 9lb cat, but still… 🙂 This fudge is SO CUTE! can you just do the purple part? You can, but it would be easier to do it with purple candy melts from the craft store. Nearly undone by a spider, huh? No shame in that. We’ve all been there. But treadmills can be dangerous when you’re fighting off the wildlife! This fudge is AMAZING. And you had to do math to get it right. I’m so impressed! How stinkin’ fabulous is this!! Aside from the spider, I’m all in! Thanks for sharing your amazing creativity!! LOL—it’s amazing how easily we can spook ourselves. 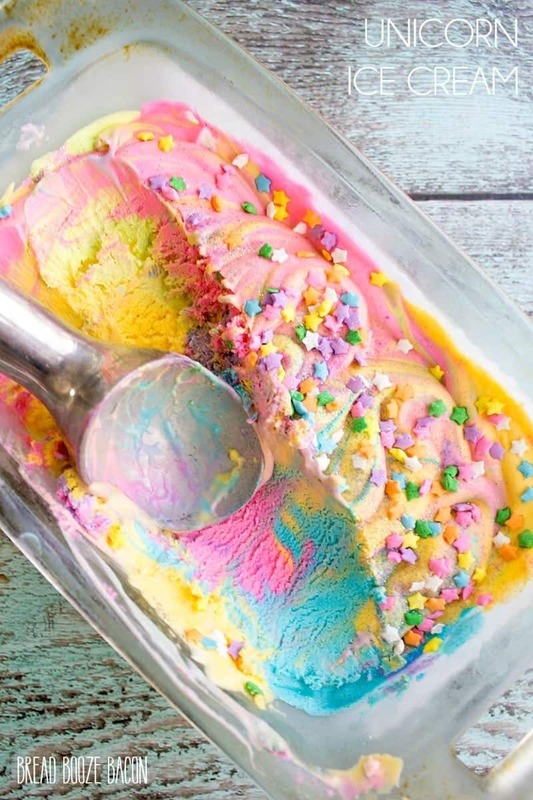 What a cool rainbow treat!!! I am just loving this fudge Lisa! Rainbow everything! Holy crap! this is amazing!!!! and so pretty! My nieces will go wild over this one! So pretty. I just made this fudge for my granddaughter for her birthday. It is colorful, but the taste is awful…way TOO sweet. It tastes like melted white chips, which is pretty what it is. It needs some kind of extract flavoring…probably vanilla. And heating the chips at 100% power is too high; the white chocolate will seize up. It’s best to melt it at 50% power. Sue, I’m so sorry you didn’t like it. You certainly could use an extract to flavor it more. Probably the best way to do that would be to add the extract directly to the sweetened condensed milk. And you are right, it does taste like white chocolate chips . . . which the people I gave it to really enjoyed. Microwaves do vary, but I microwaved it exactly as described and because I melted it with the sweetened condensed milk I had no problems. how long did each layer take to cool, before adding next layer? 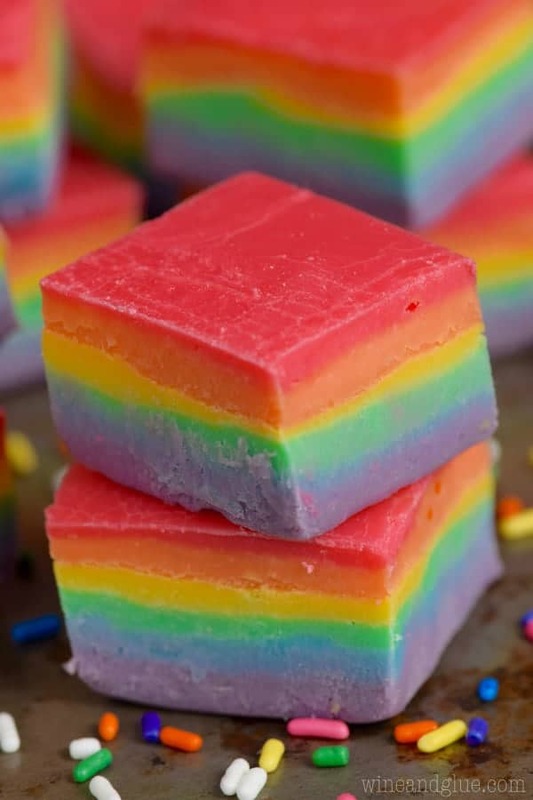 Hi it is a pretty fudge, but do you know what you could add to flavor different layers ?And how much to use and you have an idea on which flavors would be good? Do you think Peanut Butter could be used for one flavor, or would it take away from the color? 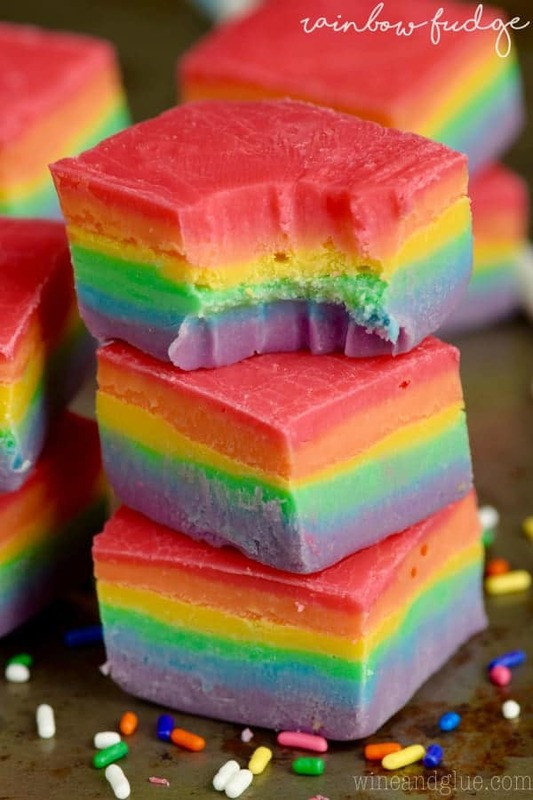 I love rainbow fudge (I found this while looking to print the recipe for a coworker) and I always flavor the different layers with dry flavorings such as powdered freeze dried fruit, grated spices, and pulverized dried citrus peel. I use pandan leaf extract for the green layer, which adds a rich vanilla-like taste. The flavors mesh interestingly as one eats the fudge. For my last batch I did in rainbow order: powdered straweberries, powdered orange peel, powdered ginger, pandan extract, nutmeg, and powdered blueberries. I’m thinking of using raspberries for the next batch.